An Artist Created a Public Sculpture Inspired by 100 Recent Murders in L.A.
Teresa Margolles is fascinated by death. The Mexican artist studied forensic medicine, worked in a morgue, and even founded an artists’ collective named after the Mexican coroner’s office. Her sculptures, photos, and performance art — which frequently comment on the gang violence in her native Culiacán, where she was born, and Ciudad Juarez, the city she now calls home — have incorporated bullets, crime scene evidence, and human blood. So when Margolles was approached about creating a piece for “Current: LA,” Los Angeles’ first public art biennial, she immediately turned her attention to the city’s crime records. Scouring through more than a year of homicide reports in the L.A. Times, Margolles identified 975 murders that took place in L.A. between January 1, 2015 and July 1, 2016. She then sent a team of 20 artist volunteers to visit 100 of the public sites where those murders occurred, creating a map of the city through its violence. “The homicides were really striking in a number of ways,” says Irene Tsatsos, a member of the biennial’s curatorial committee who also serves as director of gallery programs and chief curator at Armory Center for the Arts. “One is how young many of the victims were,” she says, noting they represented a wide range of geographic and cultural diversity within the city. Teresa Margolles inscribing the sculpture during a ceremony on July 21, 2016. Panic Studio LA, Courtesy of City of Los Angeles Department of Cultural Affairs from its CURRENT:LA Water Public Art Biennial 2016. At each location, the artists used a wet sponge to mop up the streets and sidewalks where the bloodshed once occurred, wringing out the grit and debris and dumping it into a bucket of water that Margolles would later combine to make a concrete mixture. 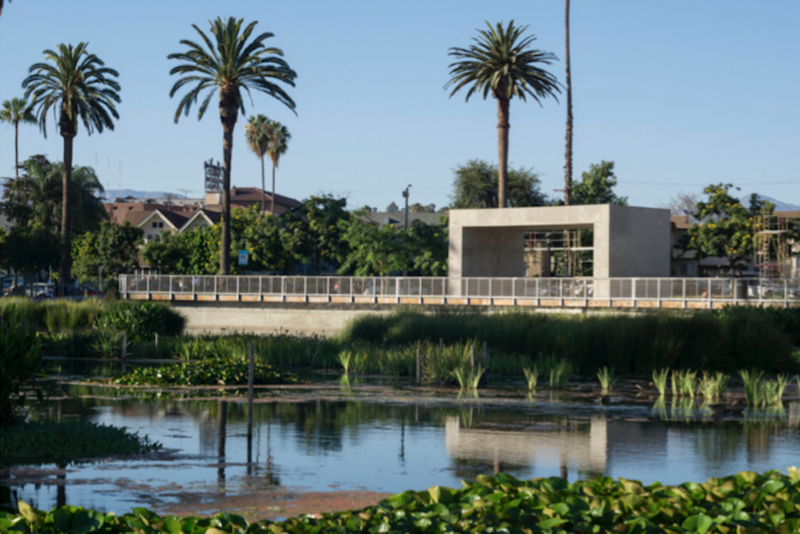 The resulting sculpture, a boxy, tunnel-like structure made in part from the grime collected on the street, was installed this week in Echo Park Lake. Named “La Sombra,” which translates to English as shade or shadow, is one of 16 different public art sites throughout the city on display now through August 14 as part of “Current: LA,” a city-sponsored exhibition that asked artists to interpret the theme of water. “It’s a structure that provides a kind of comfort and a place to rest, and a place for recollection and also evidence of a very large cycle of water and life and community,” says Tsatsos. The ominous concrete structure serves the functional purpose of offering a respite from the sun, but it’s also a large-scale monument to the dead, erected in of one of the city’s most iconic public parks — a place that, not so long ago, was plagued by gang violence of its own. 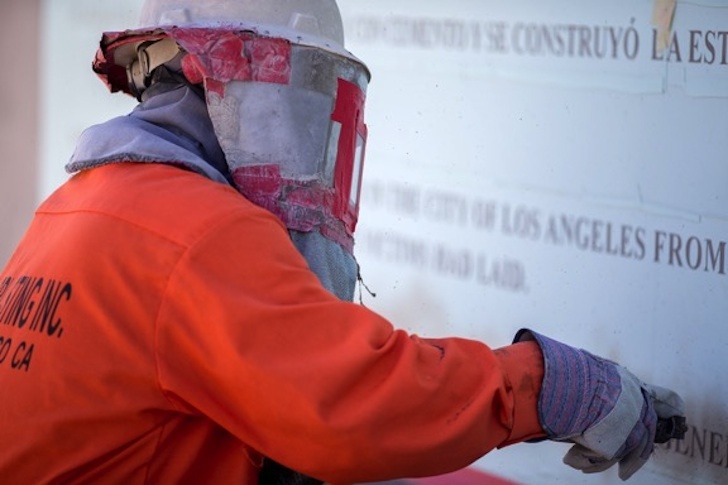 The sculpture will be on view in the park through next month, and a documentary about the process of making it — including footage of the crews visiting each of the homicide locations — is also being screened at shops and venues in the neighborhood including Echo Park Film Center, El Clasico Tattoo, and Eyla Hair Salon.